“It’s the first time community organizations are able to reach that scale without labor support,” said Avila-Hernandez. Labor groups have given ICS funds for their campaign, but the Eastside community outreach group has lead the campaigns efforts. All the volunteers are local and are a mixture of paid volunteers, youth from five partner high schools, and parents and adults from organizations like Familias Unidas, Boyle Heights Learning Collaborative, Union de Vecinos, East Los Angeles Community Corporation, Proyecto Pastoral and Legacy LA. Leon, a child development major at East Los Angeles Community College, has helped in political campaigns before. 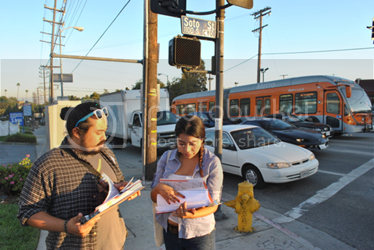 She worked on Council Member Jose Huizar’s reelection campaign in 2010, as a phone banker and data collector. Growing up in East L.A., she didn’t know Boyle Heights well, and admitted that she was a little scared to do door knocking in places such as Wyvrenwood and Estrada Courts. Guys have hit on Leon, but she tries to stay focus on her script even when it gets awkward for her. At night, Huerta and Leon walk houses together. If they need to canvass a back house, they look at lighting of the lot, the type of entrance and the time of day to see if its safe. At Wyvrenwood, Leon said a tenant at the apartments told her to come back during the daytime. “People are nice. They’re looking out for me like mija, it’s late. Someone young and pretty like you, it’s really dangerous,” said Leon. While the safety on Eastside has improved, the dangers can rear their heads at anytime. A couple canvassers were caught between a drive-by shooting, and another group had an encounter with a pervert. Though these incidents have been exceptions, people have been friendly to a majority of the canvassers, said Avila-Hernandez. If residents don’t have time, they’ll tell the volunteers to come back later. This job requires a lot of luck, whether it’s avoiding dogs in the front yard, or getting past a locked apartment entrance. Obstacles such as dogs and locked fences or gates were a problem for Leon to even reach the front door. Almost every house had a dog at the front of the house, and all were barking at Leon.”They spoil it and then we can’t go in there.” If an apartment is locked, that’s more than 30 people at most that are missed because they can’t get through the front door. If they are lucky when they pass by, someone opens up the door for them. Walking around, time just flys by, said Huerta, who’s been a Boyle Heights resident most of his life. For him, it’s been a time to revisit places he used to live, and run into familiar faces. “It’s like yeah, tiny dogs, gangsters, it’s the normalcy. It’s what I’m used to.” said Huerta.